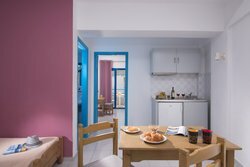 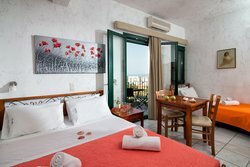 All rooms at Erofili Apartments in Hersonissos are fully equipped with all the necessary facilities in order to ensure your comfortable stay. 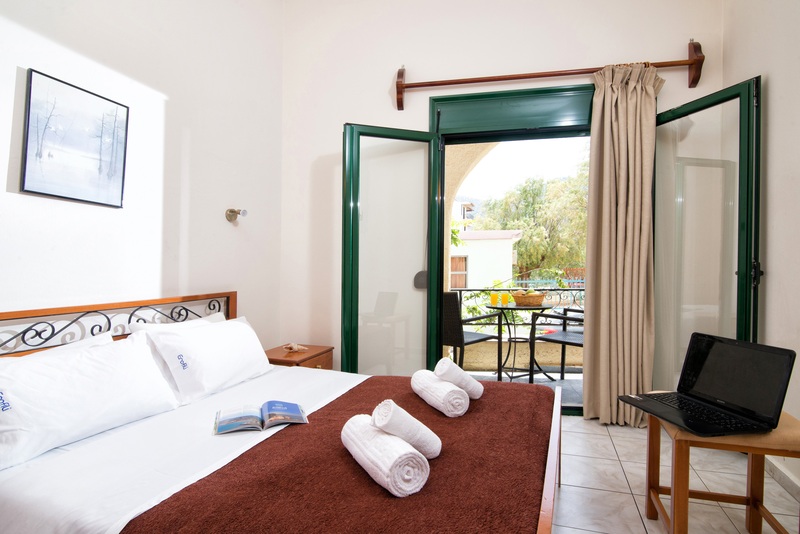 The rooms are spacious, air conditioned and offer a free Wi-Fi access. 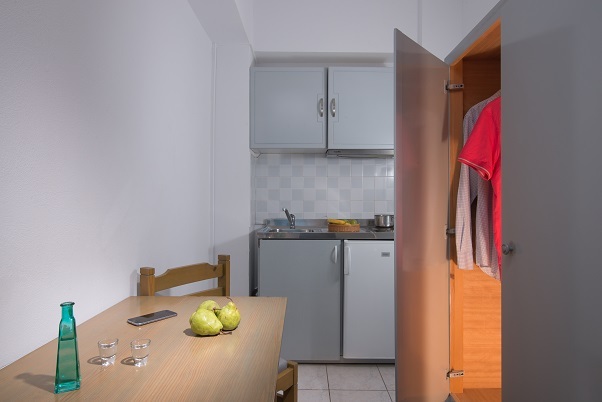 You can make your choice between a studio, one or two-bedroom apartments. 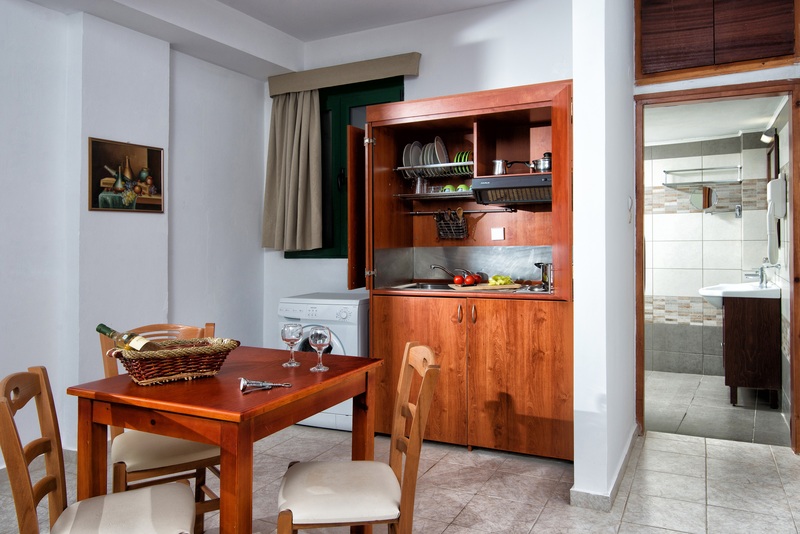 Each has an equipped kitchenette, where you can prepare your meals on your own, and a mini refrigerator. All unit facilities include a flat-screen TV and a safety box. 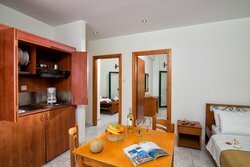 The Family rooms (up to 6 persons) also provide a washing machine. 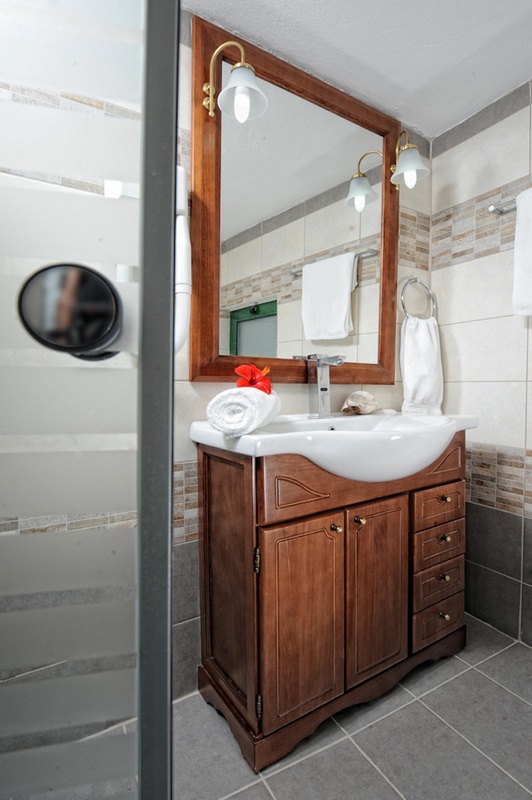 The bathrooms are tastefully renovated and include a shower. 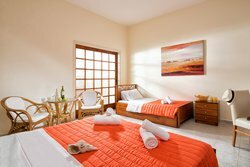 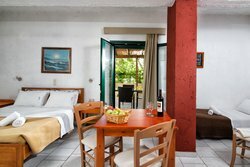 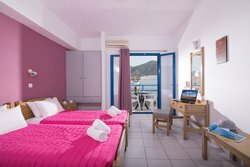 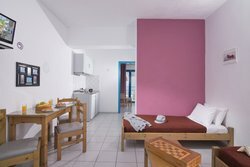 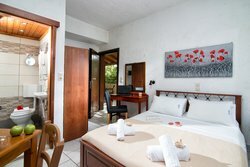 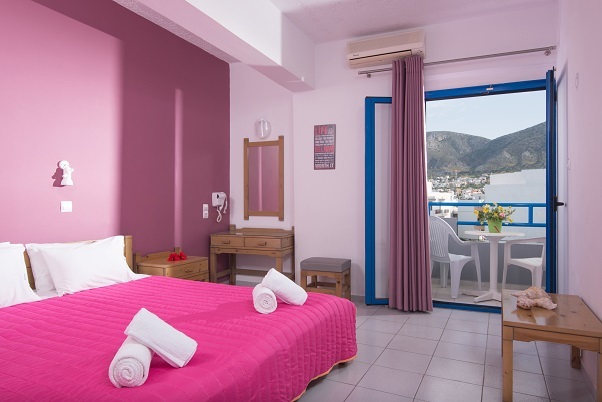 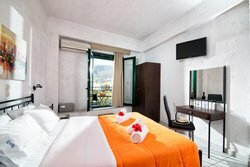 Each room has a private furnished balcony where you can relax and enjoy the sea, the mountain or the local scenery view. 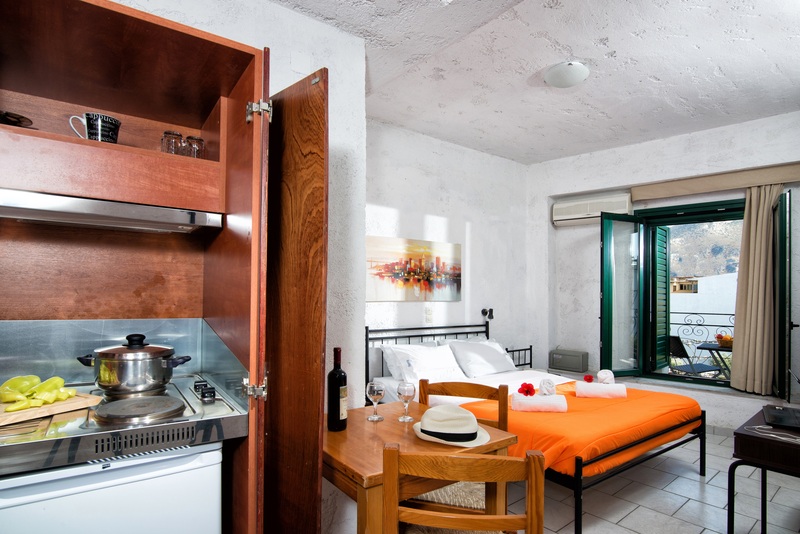 The apartment is ideal for 3 people and it can even facilitate 4 by making use of a trundle bed. This is a one bedroom apartment. 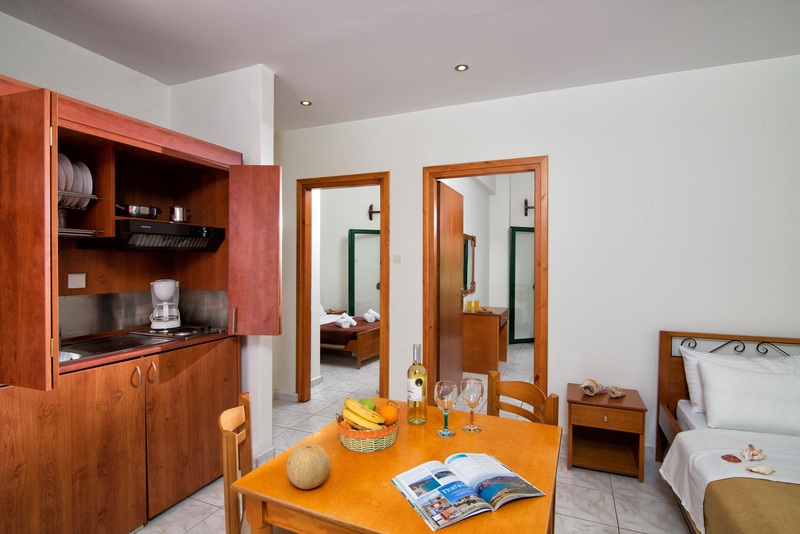 It consists of one bedroom, a separate dining area and a recently renovated bathroom. 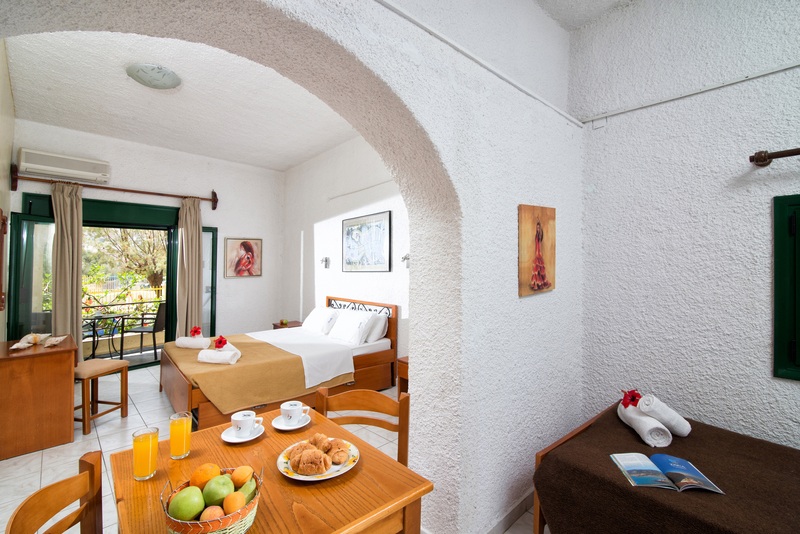 It is fully equipped with all the necessary facilities in order to ensure your comfortable stay. The apartment is spacious (40 square meters), features a double a single and a trundle bed, is air conditioned and offers free Wi-Fi access. The room features a flat screen TV and a safety box which is provided to our guests free of charge. The room is also equipped with a coffee maker, Tassimo Coffee machine (on request), kettle and iron with iron board (on request). 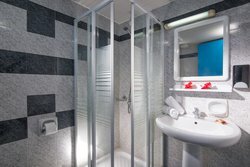 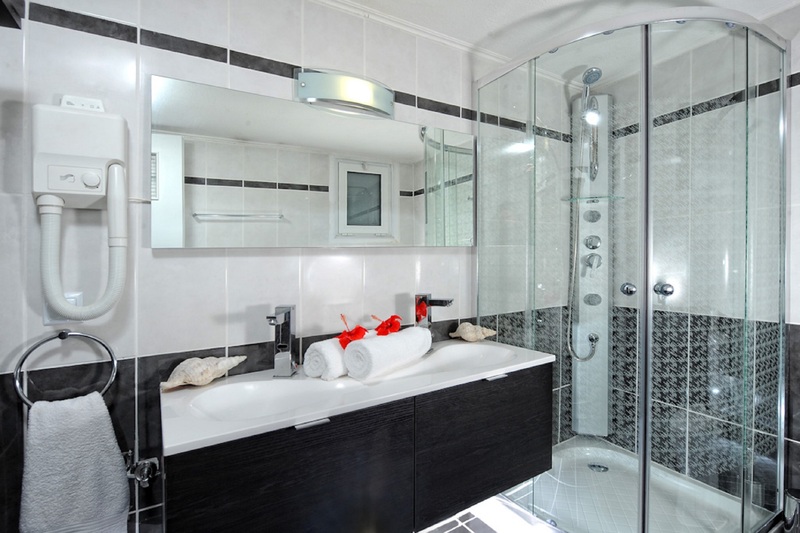 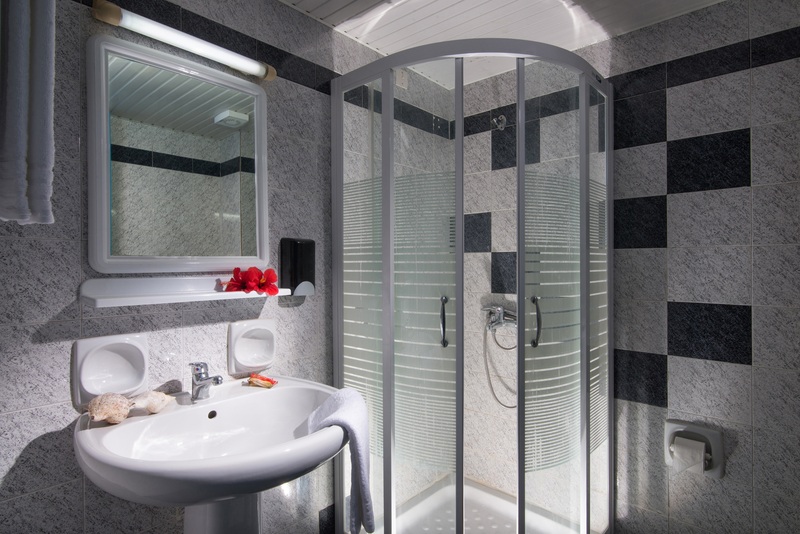 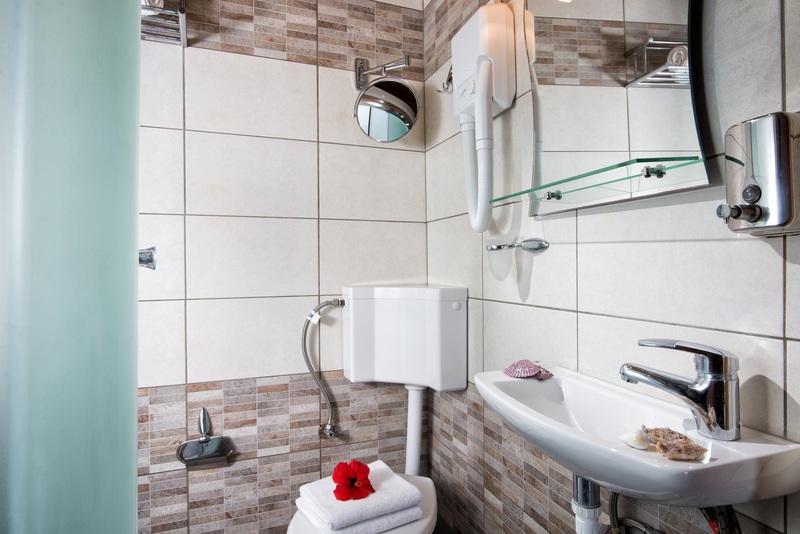 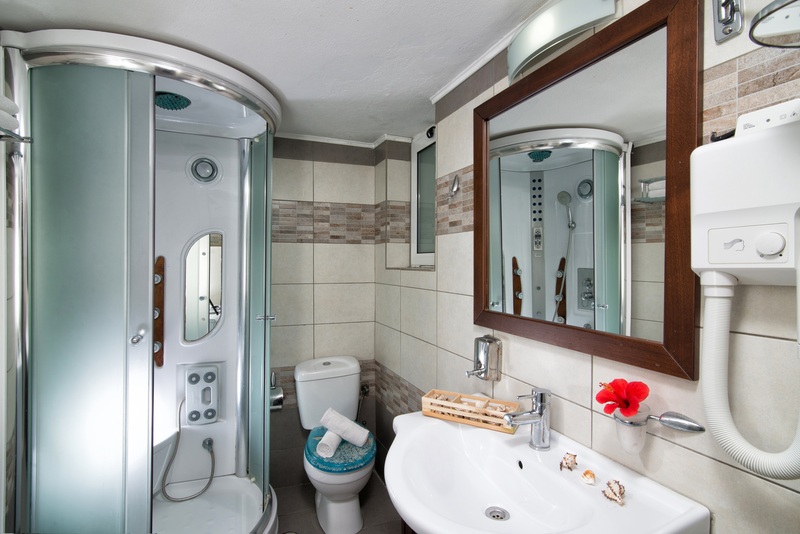 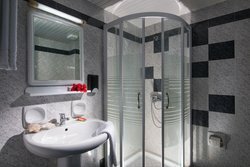 The bathroom is tastefully renovated and includes a hydromassage shower and a hairdryer. 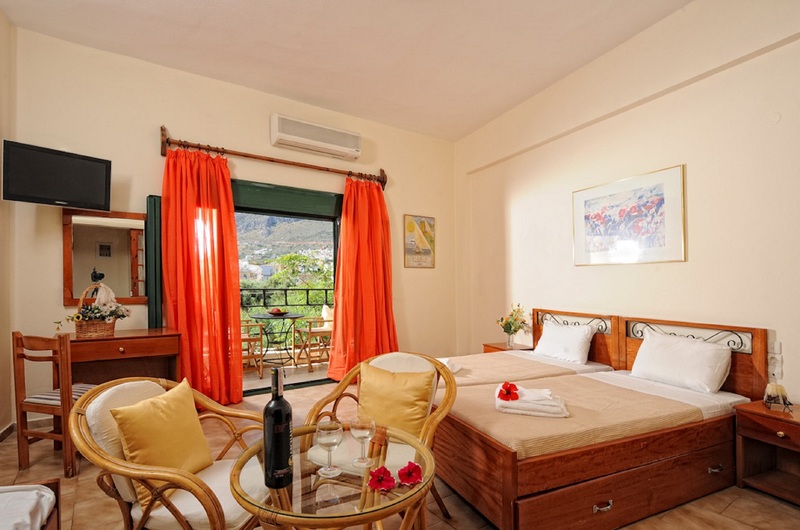 Finally the room has a private furnished balcony where you can relax and enjoy the mountain and street view! Our standard studios are an excellent choice for solo travelers and couples. 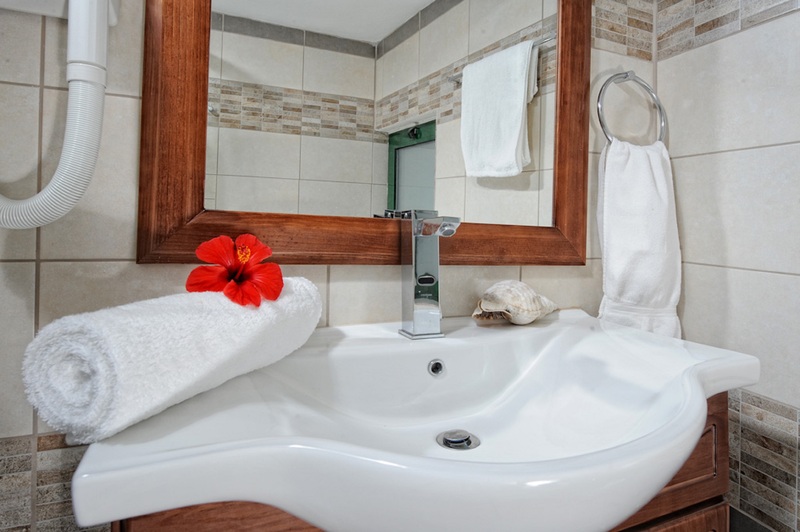 They are fully equipped with all the necessary facilities in order to ensure your comfortable stay. 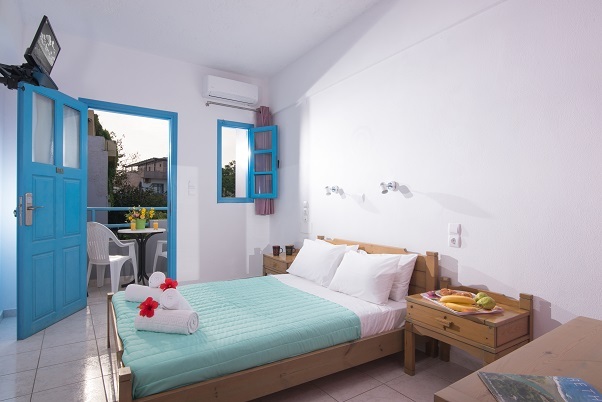 They are spacious (25 square meters), feature a double bed, are air-conditioned and offer free Wi-Fi access. Each has an equipped kitchenette, where you can prepare your meals on your own, and a mini refrigerator. 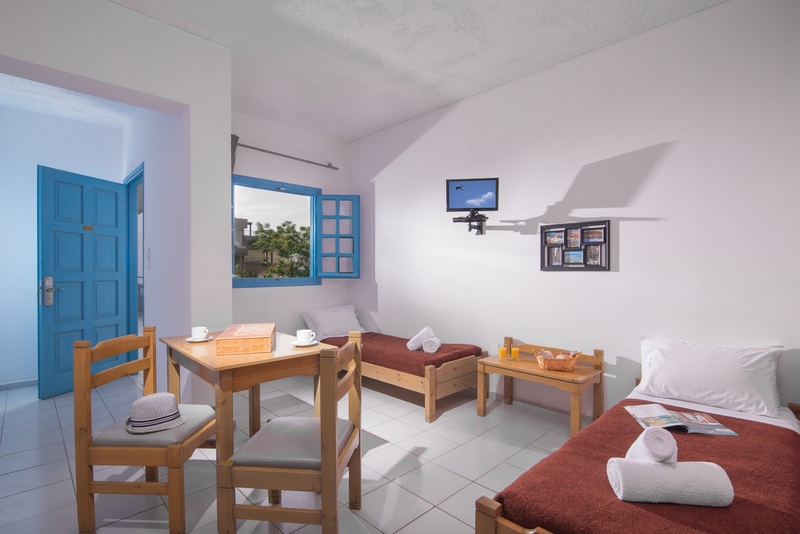 The studio also features a plasma TV and a safety box which is provided to our guests free of charge. 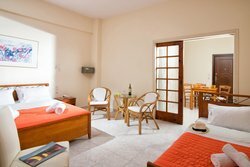 The room is also equipped with a coffee maker, a Tassimo Coffee machine (on request), kettle and iron with iron board (on request). 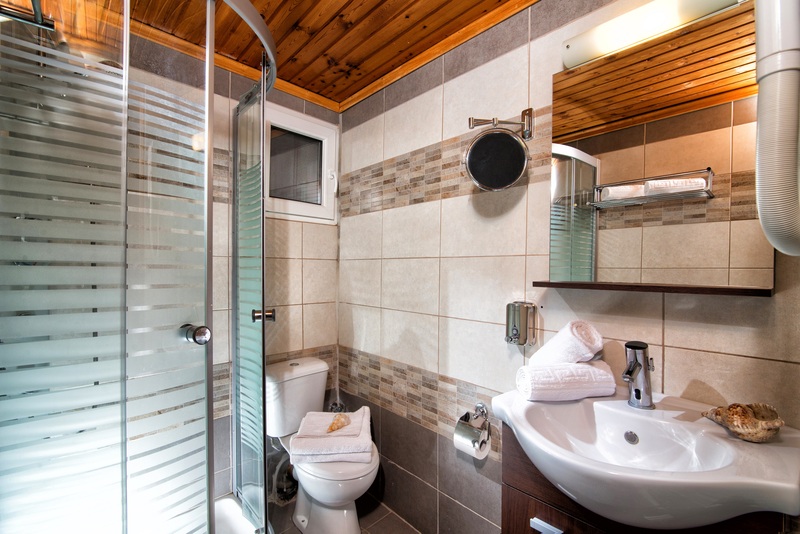 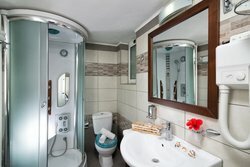 The bathroom is recently renovated and includes a shower and a hairdryer. 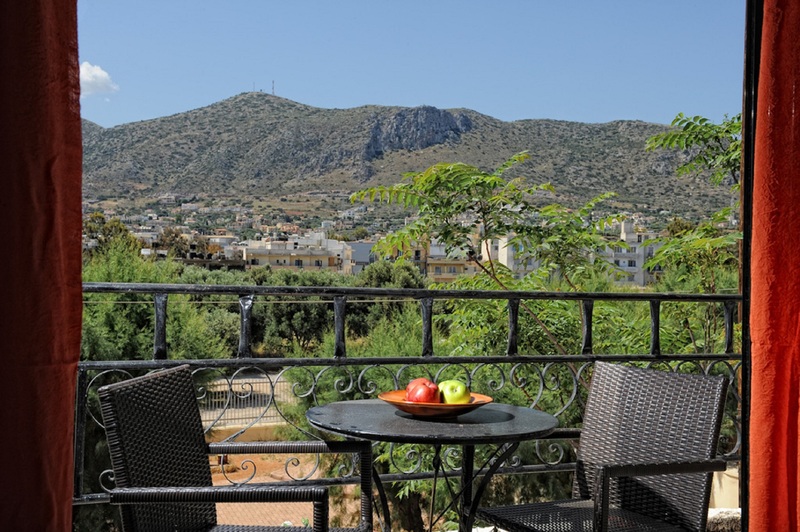 Finally, the room has a furnished balcony where you can relax and enjoy the countryside view! 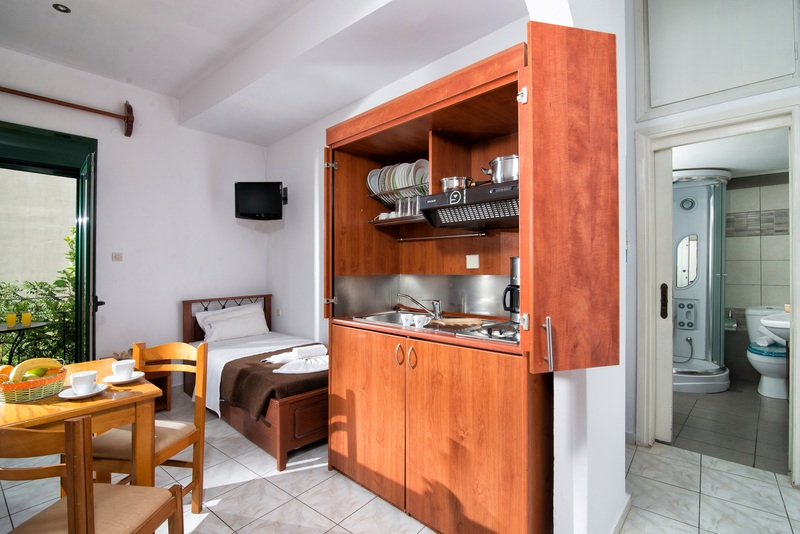 This is a one bedroom apartment. It consists of one bedroom, a separate dining area and a recently renovated bathroom. 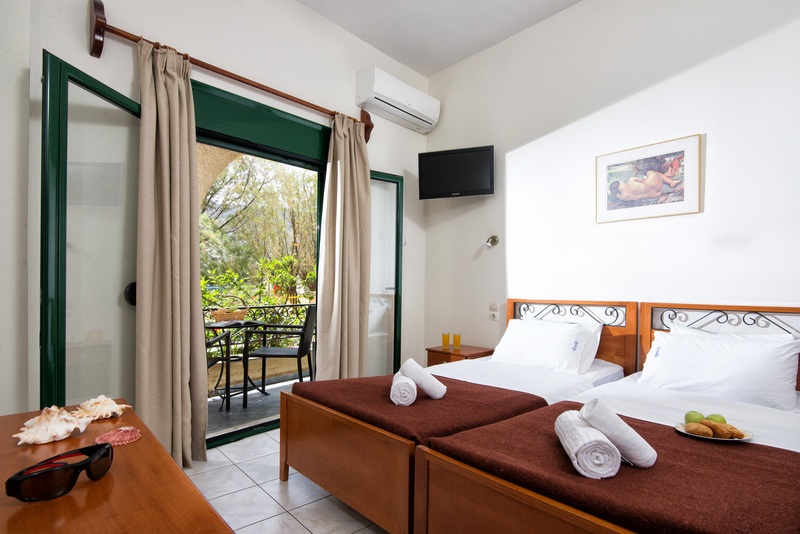 It is fully equipped with all the necessary facilities in order to ensure your comfortable stay. 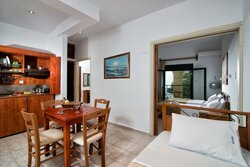 The apartment is spacious (40 square meters), features a double and 2 single or 4 single beds, is air conditioned and offers free Wi-Fi access. 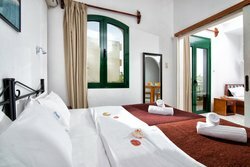 The room features a flat screen TV and a safety box which is provided to our guests free of charge. 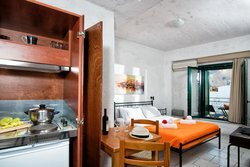 The room is also equipped with a coffee maker, Tashimo Coffee machine (on request), kettle and iron with iron board (on request). 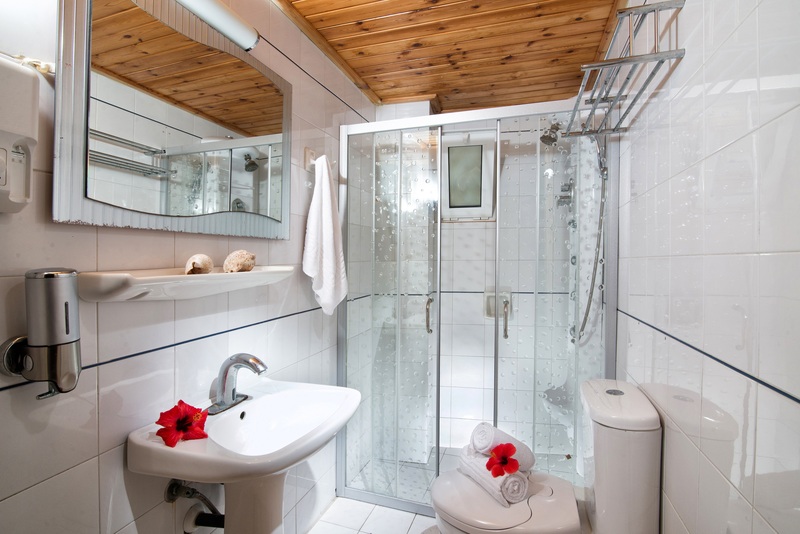 The bathroom is recently renovated and includes a shower and a hairdryer. Finally the room has a private furnished balcony where you can relax and enjoy the mountain and street view!